About Graphic Image: You know these products. They have been sold for generations in the best stores around the world. Maybe your professor had one, or the lady you noticed writing in her journal at the coffee shop. Made by a family-owned company in Melville, New York, Graphic Image produces the highest quality leather-bound books in the U.S., perhaps the world. But rather than ostentatious logos, Graphic Image’s brand is built on quality materials, painstaking workmanship and simple, yet elegant designs.It starts with great leather. Our collection is made from the finest genuine goatskin leather, which is incredibly durable and will last a lifetime. That’s why priceless books, such as the Gutenberg Bible, are typically bound in goatskin.Our Smyth-sewn binding allows these books to remain open and lay flat. Our paper is an industry secret: the writing surface is smooth, the ink is absorbed quickly, and the pages have the perfect opacity so the writing doesn’t show through. Just write your first sentence and you’ll be hooked.Each book has gilt-edged pages that are not only beautiful, but also serve an important function. When the book is closed the gilding creates an impermeable seal which prevents moisture from seeping in and keeps the pages from yellowing. Additionally, many of our books feature a satin ribbon marker.We are proud to say the majority of our customers are return purchasers. 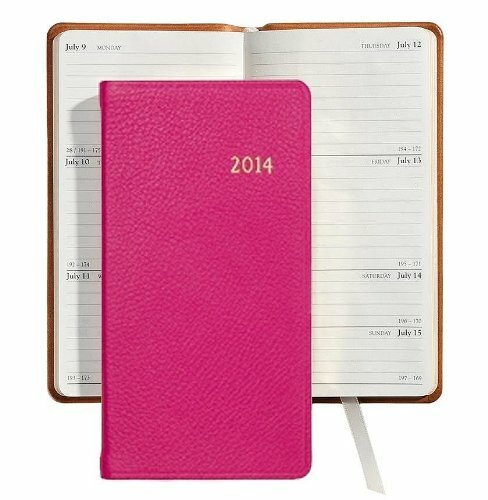 After you have used one of our journals or calendars, you’ll be back too.Product Info: This well designed book has become an unmatched standard among pocket diaries on the market today. Our 6-Inches personal pocket journal features both month-at-a-view and week-at-a-view pages in one book. Includes 12 pages of full color maps, listings of national holidays for United States and Canada, U.S. area codes, international dialing codes, plus much more.